We know from fossil records that on a fairly regular basis, to the order of 26 – 30 million years or so, mass extinctions occur. Various theories have been proposed to explain this. One current theory is that every 30 million years the Earth is subject to heavy bombardment by asteroids, or comets. 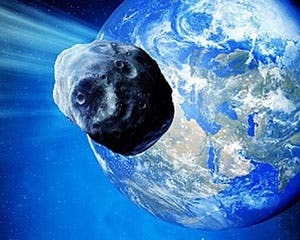 The potentially hazardous asteroid '(101955) 1999 RQ36' has a one-in-a-thousand chance of impacting the Earth, and more than half of this probability indicates that this could happen in the year 2182, based on a global study. "The total impact probability of asteroid '(101955) 1999 RQ36' can be estimated in 0.00092 — approximately one-in-a-thousand chance — but what is most surprising is that over half of this chance (0.00054) corresponds to 2182," explains María Eugenia Sansaturio, of Universidad de Valladolid (UVA). The research also involved scientists from the University of Pisa, the Jet Propulsion Laboratory and INAF-IASF-Rome . Scientists have estimated and monitored the potential impacts for this asteroid through 2200 by means of two mathematical models (Monte Carlo Method and line of variations sampling) of the "Virtual Impactors" (VIs) -sets of statistical uncertainty leading to collisions with the Earth on different dates of the XXII century. Two VIs appear in 2182 with more than 50% chance of impact. Asteroid '(101955) 1999 RQ36' is part of the Potentially Hazardous Asteroids (PHA), which have the possibility of hitting the Earth due to the closeness of their orbits. This PHA was discovered in 1999 and is some 560 meters in diameter. The research predicts that up to 2060, divergence of the impacting orbits is moderate; between 2060 and 2080 it increases by an order of four magnitude because the asteroid will approach the Earth in those years; then, it increases again on a slight basis with another approach in 2162, it then decreases, with 2182 is the most likely year for the collision. "The consequence of this complex dynamic is not just the likelihood of a comparatively large impact, but also that a realistic deflection procedure (path deviation) could only be made before the impact in 2080, and more easily, before 2060," says Sansaturio. "If this object had been discovered after 2080, the deflection would require a technology that is not currently available. Therefore, this example suggests that impact monitoring, which up to date does not cover more than 80 or 100 years, may need to encompass more than one century. Thus, the efforts to deviate this type of objects could be conducted with moderate resources, from a technological and financial point of view." Jason McManus via materials provided by Plataforma SINC, via AlphaGalileo.